A few months ago I tested the Salsa Fargo, and had a jolly good time doing so. It's the most versatile bike I've ever tested and a real hoot to ride. In the cold hard light of day though, when you're about to put your money on the counter, you might question whether you're actually going to ride an MTB enduro on it, or tackle the Karakoram Highway. Enter the Salsa Vaya – a more mainstream do-it-all option. It's not quite got the range of the Fargo but it's still a massively enjoyable and capable bike, that'll be a better option for many. It's a bit cheaper too. First off we'll deal with what the Vaya isn't. It isn't a chuckable city iron with discs and drops like the Kona Dew Drop, or one of the growing band of disc-clad 'crossers. It's a touring bike. With discs. That might not make it trendy, and Salsa opt for 'Road Adventure' as a less beardy way of describing it, but essentially it's a big, comfy, rangy, stable touring platform. 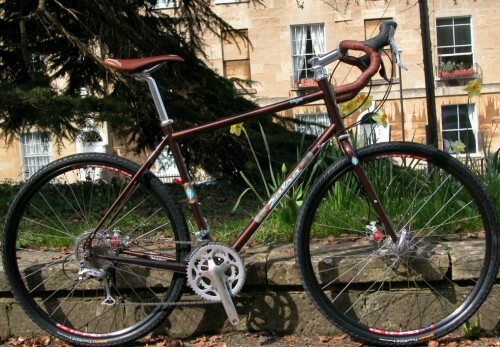 The frame uses Salsa's Classico Cromoly and the same disc-specific dropouts as the Fargo, so the same proviso about the fiddly access to one of the mount bolts applies, but other than that it's very well put together and well adorned with braze-ons: front and rear racks and 'guards, three water bottles and a pump peg. The 58cm frame (with a 58.5cm effective top tube) was perfect for my 1.90m frame and there's a good sizing chart on the Salsa website that shows what frame fits who. Transmission is a mix of Shimano's MTB and road gear, with Tiagra STI levers shifting on a 54/30 compact chainset and 11-32 rear cassette, with an LX rear mech to handle the big range of gears. SRAM's BB5 road discs do the stopping, and wheels are DT Swiss X470 rims (26" X430s on the two smallest sizes) on Formula hubs, running Conti's chunky Tour Ride rubber. Finishing kit is mostly Salsa's own, and again it's tailored to the bike size so the biggest frames get the whopping 46cm incarnation of Salsa's excellent Bell Lap bar. First impressions of the Vaya are of a bike that's easy to get on with. The position is neutral, the steering a touch on the slow side but perfect for cruising along. Everything falls to hand easily and the Bell Lap bars offer a useful and not-too-racy second position that drops you out of the wind a bit but won't stretch your back. The wheels and tyres are built for comfort rather than speed but the bike as a whole is more sprightly than the heavier Fargo, and lighter road-specific rubber (we tried some 28mm tyres for comparison) speeds up progress no end. Even with the thinner tyres pumped up hard the frame and contact points do a great job of smoothing out the ride. If you're just going to ride on the road and the odd gravel track, the tyres are the first thing we'd change. The Vaya is more than capable of handling a bit of proper off road too. Okay the tyres won't give you much grip over wet roots but it's a stable bike, sturdily built with lots of standover height and some low gears. I took it on a loop of the White Peak up in Derbyshire and it was well behaved even on the rougher sections. It feels big and a bit slow in the singletrack but that's not really what it was designed for. The all-round capability of the bike means you do find yourself darting off down lanes and tracks for a poke about, even when you're meant to be on a road ride. It's a very liberating experience. The bike gets better the longer you ride it. When you set off you're maybe thinking of how much faster you'd be on that racier steed you've got stabled in the shed, but a few hours in and you realise you're looking around at stuff, you're comfortable and you're enjoying yourself. You might not have gone quite as far, but you'll have seen much more. Touring's great like that. Sorry, Adventure Road riding. Having said all that, there's no reason why you can't also go day-to-day on the Vaya for your commute and shopping trips. After all, it's easy to ride and built to last. It's not the fastest skipping through traffic but it's perfectly rideable in town. Similarly there's no reason why it couldn't handle a faster pace on an Audax, say, especially with a change of tyres. The 11.7kg weight will drop a bit with skinny rubber and the position is great for eating up the miles. I did load the bike up in various ways: with panniers, with a child seat and with a trailer (not all at once) and it was perfectly happy pootling around weighed down with whatever I could throw at it. I didn't take it on an epic tour to the Pyrenees, but I'd certainly like to. However, I'd question whether it'd be better with a road triple or even an MTB triple rather than a compact. It is a tourer after all, and 34/32 sounds like an impossibly low gear until you're trying to haul 20kg of luggage up the Tourmalet, at which point you'd probably be pretty grateful for another few ratios. 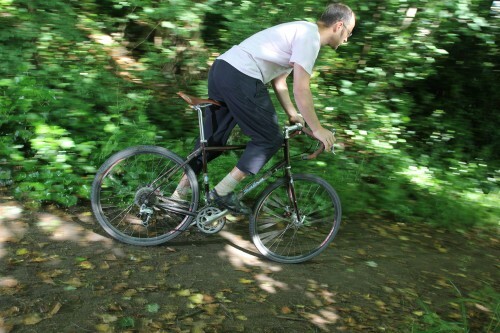 Having said that the Vaya is a very happy climber and easy to spin up the hills. Point it down and the combination of the easy steering and powerful brakes make descending pretty stress-free. Whilst we're on the subject of the brakes, though they're good – plenty of power and easy enough to adjust – I did find myself pining for the BB7 Mountain stoppers of the Fargo, which are a class above but not an option here because the STI levers don't pull enough cable. BB7 road units would have been nice though, and can be found on bikes costing a lot less than this. The transmission worked its faultless magic throughout. Tiagra levers are the lowest level at which I find I can shift without thinking, and the MTB bits worked perfectly with them, no issues there. Overall I found the Vaya a really enjoyable ride. It's perfectly set up for comfortable and enjoyable riding, the spec is well thought out and functionally excellent. You could throw most tasks that come under the umbrella of road cycling at it and have a good time, and what it lacks in ultimate versatility it makes up in lower weight. Given that it's a pure-and-simple touring bike, though, it's easier to compare with other touring bikes in terms of value. Salsas aren't cheap: the Fargo, at £1600, is a fair whack but there's nothing really to compare it to, except the Singular Peregrine and a few other very niche bikes. There's a raft of tourers out there though, and the Vaya is competing with them on price as well as performance. Take for example the Kona Sutra we currently have in on test: it's £350 cheaper for a bike that not only comes complete with racks and guards but also scores BB7 discs and an XT mech. Okay it doesn't have STI levers, but it's a lot of bike for the money. It'll be interesting to see how it scores on the ride. Suffice to say that the Salsa will appeal most to people who want something a different and are prepared to fork out a bit extra, but still want a bike that performs. 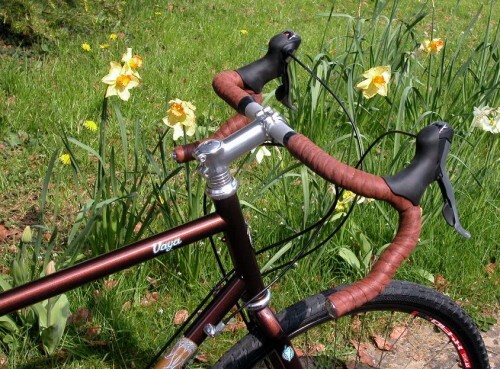 It'll be money well spent with the Vaya: it's a lovely bike, comfortable and versatile. Me? I think I still want a Fargo. But I'm odd like that. The Vaya is our road adventure bike, designed to take on any surface that someone might consider a ‘road’. Crafted of Salsa Classico CroMoly, the Vaya is loaded with braze-on’s for fenders, racks, and lowriders. This makes everything from wet weather commutes to full-on touring a breeze. Stable geometry keeps the bike from being twitchy, and makes the bike a pleasure to ride while loaded. Our two smallest Vaya sizes use 26” wheels to provide better fit, improved standover clearance, and to eliminate toe overlap. The larger Vaya sizes use 700c wheels. Enjoy a long day in the saddle. Link up pavement and gravel. Hit that limestone rails-to-trails route you’ve always wanted to do. Do a light tour. Or load your panniers to the hilt for a month of two-wheeled exploring. The Vaya will get you there. And bring you back. Vaya. A true do-it-all road-riding bike. Good review! Looks like a good bit of kit, not too flashy looking either so it wouldn't attract too much attention and hopefully wouldn't be nicked! Hi do you know of any racks – front and back which will fit a salsa vaya? Just bought one without realising the racks do not appear ready to ship and we are going bike touring before the date??? It's a wonderful bike going to be disappointed if I cannot use it! Does anyone know if the Vaya is Rohloff speedhub compactible? "Does anyone know if the Vaya is Rohloff speedhub compatible?" It's an absolutely standard vertical dropout. There aren't any mounts for torque arms or wotnot, and you'd need a tensioner. So no more so than any other bike that hasn't been designed with one in mind I think. I've been running a Vaya for a little while now, and am a great fan. I bought the frame only, and am running it with SRAM Apex (same gear range as the bike tested) and Avid BB7 discs. I've settled into a rather lower position than the bike tested. Bars are standard drops rather than the Bell Laps, and the stem is slammed to the headset and flipped downwards. The resulting position is considerably lower but still high compared to a race bike and very comfortable. - for a brief credit-card tour of Wales using Schwalbe Kojak 35mm tyres and carrying my overnight gear in a Carradice Longflap Camper SQR. Very much agree with Dave's review. This is a lovely bike to behold. Aesthetically, my groupset, wheels and finishing kit are black, which works fine with the brown (and would be borderline needed with this year's orange paint). Steering is certainly leisurely. Riding fast in a group on the audax I had a couple of hairy moments before grasping just how hard it was necessary to steer to get round a tight bend at speed. It's fine, but it will not behave like a racer at speed. By contrast, the steering and posture feels marvellously confident descending on the rough tracks of the HONC and some of the bad roads south of Bristol, and even more so descending on rough roads with a saddlebag on. Very, very confidence-inspiring. Excellent brakes and some big tyres help with that of couse. My favourites on the road have been the Kojaks - a good compromise of comfy volume and fast rolling. It's definitely possible to make it go quite fast. With road-going tyres on it will skip along, and the acceleration is far from dreadful. It will do for club runs and the odd bit of audax/sportive riding I think. There doesn't seem to be a huge amount of flex, and the dead weight isn't horrendous on the flat. If one wanted to really get silly with it, I suppose the position could be altered by putting a stem with a lot of negative rise on it, but you're working against that enormous head-tube and it isn't really the point! Weight is noticeable on the climbs, and I've a ptreference for climbing standing up, as this seems to minimise the feeling of dragging an anchor which I have felt at times. Echo Dave's comments about gearing - even with just a saddlebag of overmight things on, 34:32 is too high. I'd want a proper granny ring for camping loads or big hills. Interestingly, this year's full bike drops the big ring down from 50 to 48 but doesn't change the cassette ratios (although it's SRAM Apex this year). A word on braking. I was sceptical of disc brakes on mountainbikes, and have since been fully converted. I was sceptical of the point of discs on a road-going bike, and am completely sold on it. The ease of single-finger, beautifully modulated braking particularly in the wet is certainly worth the weight penalty as far as I'm concerned. The confidence having the power available gives on bad surfaces or in bad weather is wonderful. You sometimes hear that it's too much power, and clearly it's perfectly possible to skid the bike if you must. 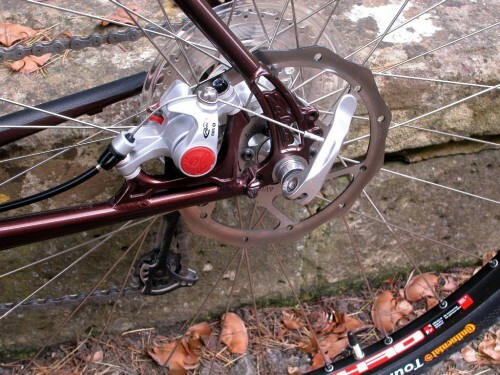 However, it's more than possible to keep the braking power under control and use it properly. I certainly haven't been sliding it down the road because it brakes too well! Poor build quality and customer service. The rear derailleur on my Vaya got caught in my spokes and the derailleur hanger cracked rather than bending. Salsa told me they used a non-replaceable derailleur hanger because it's easier to mold back into shape on a steel bike. Well if it's cracked an only handing on by a thread, that's not much help now is it. Salsa was not able to give me any help with providing replacement parts or referring to a frame builder who can do the repair siting that there's too much liability. Don't expect any customer service from Salsa. It appears that they do some simple modifications to know designs and then send all the real work to Taiwan. I suspect they are purely a marketing company. My whole problem could have been solved with a $5 replaceable derailleur hanger if they had built it that way. What are they doing building with technology from 1975 anyway?